Brown Eggs vs White Eggs: Is The Difference Only Shell-Deep? Since the dawn of man, eggs have been a staple in the diet of almost every civilization, from caveman days to modern times. Thankfully, the hours our anscestors spent foraging for eggs and other food sources have, for us, been replaced by a trip to our friendly neighborhood grocery store or farmer’s market. While our prehistoric predecessors may have gladly taken whatever eggs they could find, for us, it is a simple choice of brown eggs vs white eggs. Our goal is to make healthy food choices with as little fuss as possible, so let’s take a moment to examine the difference between brown eggs and white eggs so we know which one is the healthier option. You may be surprised to learn that the single deciding factor when it comes to the final color of an eggshell is the breed of hen that laid that egg. White chicken eggs, which are the preferred variety in most areas, are laid primarily by the White Leghorn hen. White Leghorns can easily be identified by their snow white plumage from beak to tail. Brown eggs, on the other hand, are laid by a greater variety of hens. Rhode Island Red, New Hampshire, and other varieties are common laying hens used for the production of brown eggs. These birds have red or brown feathers, and are somewhat larger than their snowy sisters. If you are interested in finding out what color of egg a particular hen will produce, there are two ways to go about it. First, if you have nothing else to do or are easily entertained, you could wait around until she lays an egg, and then just check the color. If, like me, you don’t have the time or attention span necessary, you could just look at the hen’s earlobes. There are exceptions, but more often than not, the egg shell will match the color of the hen’s earlobe feathers. 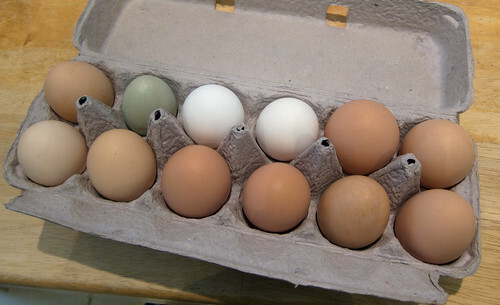 You may be surprised to know that there are more varieties and colors of chicken eggs than simply white and brown. 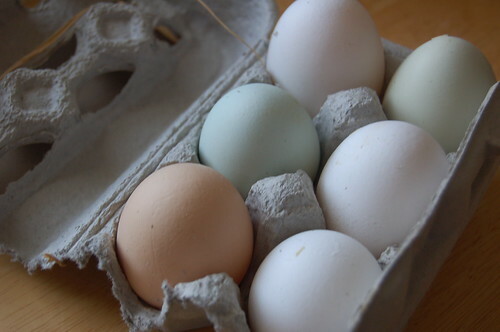 Blue eggs, green eggs, and speckled eggs are also available, though they tend to only be available through specialty stores, farmer’s markets, and directly from producers. There are a lot of misconceptions out there regarding brown eggs vs white eggs and whether or not brown eggs provide any particular health benefits. The truth is that the only difference between brown eggs, white eggs, and every other color is the shell. Nutritionally speaking, two eggs of identical size who came from hens raised in the same conditions will be exactly the same. The health benefits of one variety of egg over another have nothing to do with the color of the shell. Commercial egg farms keep their hens packed together in small, crowded cages. These stressful, dirty conditions make the hens more prone to disease. In order to prevent this and to keep production high, the hens are given high doses of antibiotics and hormones. In order to get the freshest, healthiest eggs possible, you need to shop locally and buy from small producers whose chickens are not treated with hormones or antibiotics and are allowed to forage as much as possible. These hens are healthier, happier, and produce eggs that are free of chemicals and have higher levels of omega 3′s. Sure, they may cost a little more, but the flavor and health benefits, not to mention supporting your local community, are worth it. Why Do Brown Eggs Cost More Than White? When setting the price for any sort of product, the first factor that comes into play is exactly how much that product cost to produce. White eggs are the preferred variety of egg in the majority of the United States because they are simply cheaper to produce than brown eggs. White Leghorn hens are smaller than Rhode Island Reds, which means that they also eat significantly less. When you pay more to feed a hen producing the same number of eggs, the cost per egg goes up and that cost is passed on to us, the consumers. Second, customer expectation comes into play. Most of us, when comparing two items, look at the more expensive one and automatically assume that it is a superior product to the less expensive one. Combine this with the misconception that brown eggs are somehow nutritionally superior and you have a situation where a manufacturer can raise prices a little bit more without suffering a loss of demand for their eggs. The question of brown vs white eggs also changes depending on where you live. Certain areas have a cultural preference for one type of egg over another. For example, much of New England prefers brown eggs over white eggs. While this may in part be due to the predominance of the Rhode Island Red hen in local egg farms, this is actually the result of clever marketing by egg producers. It goes without saying that the majority of the time, local agricultural products are going to be fresher than products shipped from across the country. Even I recommend buying locally whenever possible. Decades ago, the airwaves of New England were bombarded with advertising from local egg producers, extolling the virtues of their locally produced brown eggs. The message stuck, and brown eggs are still vastly preferred over white in much of New England. When you take an industrial brown egg and compare it to an industrial white egg, there is no negligible difference between the two, so you should simply go with whichever variety is cheaper in your region. If, however, you want the healthiest, tastiest egg possible, seek out a small, local producer of organic eggs whose hens are allowed to wander around outside and forage as much as possible. In the case of brown eggs vs white eggs, I call a tie.